One has to be better than good to win at the World Chess Championship. One has to be nearly perfect. But to capitalize against a player as good as Carlsen requires relentless rightness — one wrong move and a tenuous advantage can slip out of your grasp. Caruana, so sure-handed for 23 moves on Monday, forgot to dry his hands before the 24th. Just like that, his advantage was lost. Game 8 ended the way all the others had. After 38 moves and nearly four hours, the two men agreed to a draw — the eighth in a row. The best-of-12 match is level at 4-4. The two began in the Sicilian Defense, an opening that the book “Modern Chess Openings” assures is “active and unsymmetrical.” (In other words, lots of action, with very different setups for each player.) That was indeed the case on Monday. Specifically, the players were engaged in the Sicilian Defense: Lasker-Pelikan Variation. Chess fans were hopeful that this pelican would fly on Monday afternoon in London. And it began to, at least for Caruana and the white pieces. 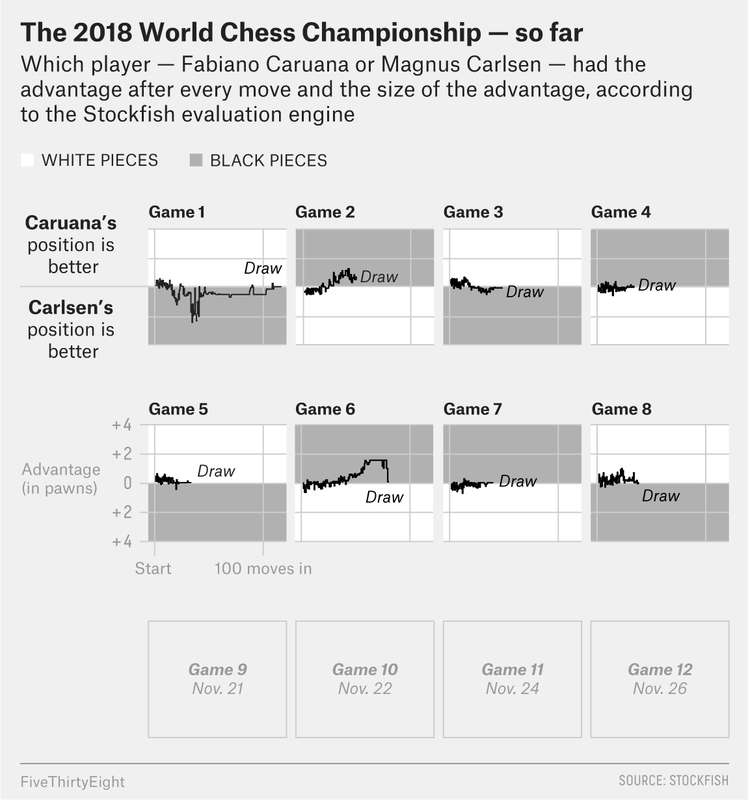 Carlsen’s early moves were thought to be slightly careless, and Caruana nursed an advantage. “I’m a little bit surprised by the opening, especially for Magnus,” said Hikaru Nakamura, the American grandmaster and world No. 16, on a Chess.com broadcast. “I think Fabiano is doing quite well.” And not only that, but by the 18th move, Carlsen had been backed into a 30-minute deficit on the clock. Caruana began to mount an attack on the queenside, including an aggressive knight that he’d installed in a forward outpost on b6, which hampered black’s artillery. Meanwhile, Carlsen’s available laser beams were pointed down the kingside, and he began to push his pawns down that flank. One of these moves — pawn to g5 — “was not a Magnus move,” Nakamura said. In other words, it was a mistake. Carlsen (playing the black pieces) appeared to be overextended on the kingside, and his king itself sat largely unprotected. The game would come down to the next couple of moves. Carlsen’s time deficit had swelled to an hour. And if Carlsen’s knight on e5 was dislodged from its station, Caruana’s paths toward Carlsen’s king would be opened wide. Would Caruana see “21. c5!”? The chess world waited on the edges of their seats. If he did, Carlsen would not be able to capture the pawn right away, as that would leave his knight undefended, allowing the bishop on c3 to attack without repercussion. The white pawn could puncture black’s territory, potentially wreaking havoc. It was likely the highest-leverage move of the match thus far. Caruana thought, staring at the position above, for nearly 34 minutes. Then he pushed the pawn. The chess world was jubilant. Maybe overly so. But pawn moves can give, and pawn moves can take. Carlsen’s position had been successfully breached, but he responded by putting Caruana on the back foot, trading pieces with Caruana to keep him occupied and away from the pawn drama. But then, on Caruana’s 24th move, the American pushed a different pawn, this one to h3. It would have been better, perhaps, to dispatch a queen into Carlsen’s territory, which would have continued to apply the pressure. It was a subtle but crucial misstep — a move too slow and plodding to build a successful attack on the world champion. Four games of the regulation 12 remain, and quicker tie-breaking games will follow if necessary. The match rests tomorrow and resumes with Game 9 on Wednesday at 3 p.m. Greenwich Mean Time — that’s 10 a.m. Eastern. I’ll be covering it here and on Twitter. He appeared to be similarly beatable against Sergey Karjakin in 2016, as well. Yet Carlsen went on to win that match in tiebreakers.